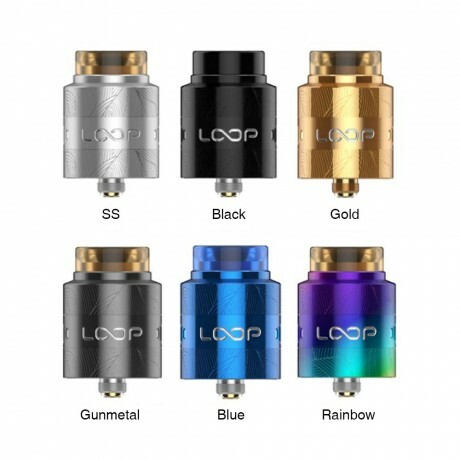 Geekvape Loop V1.5 maintains the original W-shaped build deck and the surround airflow system is upgraded with a Sieve design to ensure a complete airflow which significantly enhances the flavor while minimizing leakage. Its arrayed airflow design provides precise control, sieve bottom airflow ensures an ultra smooth airflow that enhances the flavor significantly. OBS newly released a stylish and compact kit - Cube, which comes with ergonomic design and high-tech appearance for comfortable gripping. Powered by built-in single 23600 battery with 3000mAh capacity, Cube mod supports 80W max output with high performance VW mode. Besides, it features 0.96 inch LED screen, instant 0.01s firing speed, exquisite buttons and intelligent protection, providing you a powerful yet simple and safe vaping experience. The paired Cube tank has 2ml/4ml ejucie capacity choice. It’s equipped with powerful 0.2ohm mesh coil for awesome flavor and massive clouds. No matter you’re a starter or veteran, OBS Cube is worth of your try. Introduce you the latest kit from Joyetech, called eGo AIO Mansion. Inspired by the Empire State Building, it has the classic all-in-one design for convenient usage and easy carrying. eGo AIO Mansion is equipped with 2ml ejuice capacity, satisfying your daily vaping needs. Powered by the 1300mAh built-in battery, it adopts 7-color indicator lights for precise battery status. The cool feature is that you have two ways to vape - direct inhale or hold button to vape. Together with the new BF SS316 0.6ohm head, eGo AIO Mansion provides you a pleasant vaping experience with soft flavor clouds. 5 fashionable colors in available. How about some long-lasting EUC CCELL coils, a built-in 1400mAh battery, the latest OMNI Board Mini, top filling system and top adjustable airflow. We combined all of that in one device and proudly present you the Vaporesso Drizzle Fit Starter Kit. It is a compact and portable kit that allows you to freely switch from MTL to DTL with the latest OMINI Board Mini since this chip recognize the coils resistance and able to set the vaping wattage intelligently. It is recommended to use ejuice with high nicotine strength since the EUC CCELL coil is able to absorb and vaporize them more efficiently to bring smoother flavors with satisfying texture. Are you looking for the best tobacco vape juice to get that cigarette smoking sensation? TheUSALT PG+VG Premium Nicotine Salt E-liquid E-juice 30ml is here for the ultimate satisfaction. Various delicious flavors with 50mg nicotine strength. Enjoy the smooth throat hit and have fun exploring our mouthwatering flavors. 1. Unprecedented Online Giveaway. 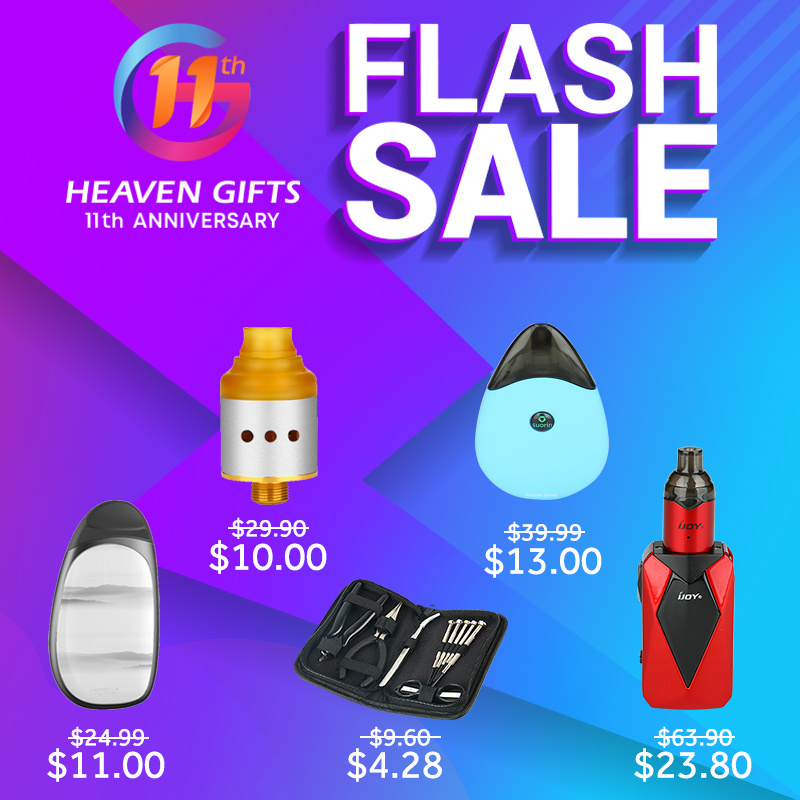 Heaven Gifts is with many world renowned e-cigarette brands and manufacturers to give away thousands of vape products on all platforms, like Youtube channels, E-cigarette forums over 40 countries, Instagram, VK, Facebook, Heavengifts.com etc. 3. Flash Sale. Hundreds of vape gear that labeled at quite lower prices is ready for your purchasing. Guys, can't wait to tell you that one of most exciting part of our 11th anniversary - Flash Sale is coming soon. Here you can get your favorite products at the lowest price through the year! No matter for your beloved family or yourself, it's a rare opportunity. What are you waiting for? 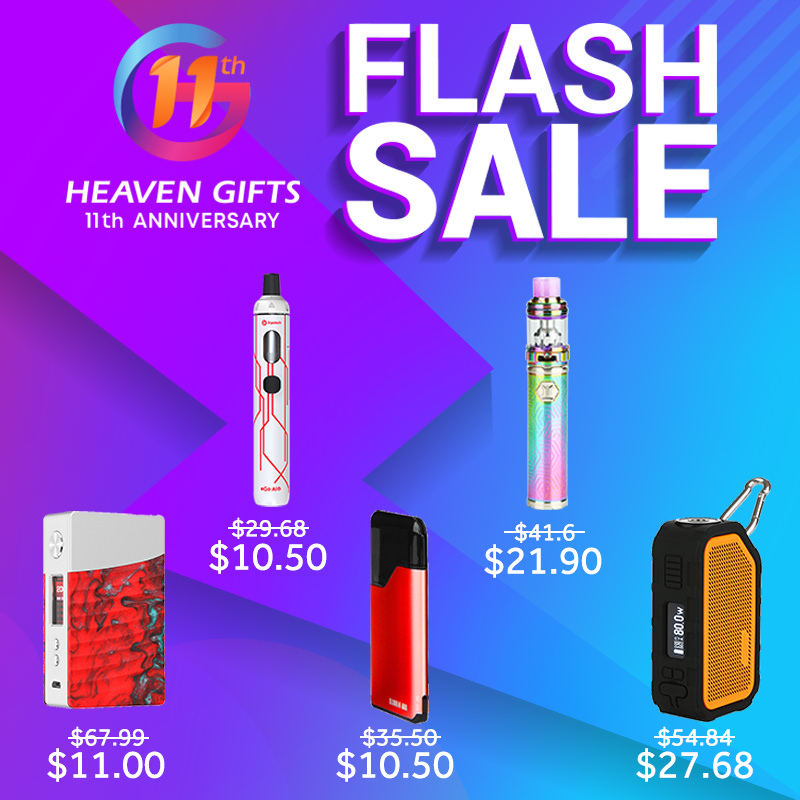 The flash sales will last 11 days. Each day we will specially prepare 5 hot devices on the market. Limited quantity, 24 hours only! Buy it now! Guys, can't wait to tell you that one of most exciting part of our 11th anniversary - Flash Sale is coming soon. Here you can get the favorite products at the lowest price through the year! No matter for your beloved family or yourself, it's a rare opportunity. What are you waiting for? The flash sales will last 11 days. Each day we will specially prepare 5 hot devices on the market. Limited quantity, 24 hours only! Buy it now!